After 4 trains several taxis and a plane from Dussledorf we arrived at our hotel, The Albergotto, in Florence. It is a very nice and hospitable bread and breakfast opposite the Palazzo Strozzi in the Via Turnaboni. So, what do you do most in Florence? Walk and gawk! The town is not that large and it has many pedestrian zones so taxis are impractical. The bicycles and motorcycles, however, go wherever they wish and the streets are not very wide. The Via Santa Spirito was a main thoroughfare into town in the 15th century. Carriages were only introduced in the mid 16th century and by then it was too late to widen the streets! Of course, along the way you stop in your tracks to stare at the incredible sights be they across the Arno or staring at a church, Cathedral or other architectural wonder. When you arrive at your destination, be it a museum or church again you stare and ogle with guidebook or Iphone in your hand to try to read up at the same time. The town seems overrun with students like Fort Lauderdale at Spring Break, but in this case they are students of all ages with teachers trying to teach against all odds. So one races to beat the large school groups to the door of the church or museum. Happily in some cases one can purchase tickets in advance, which allow entry through a separate door. 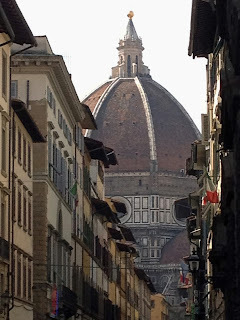 The first day we did a guided tour of Brunelleschi’s Florence. 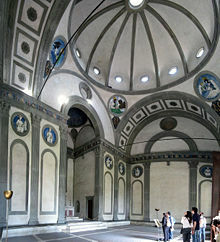 The dome of the Duomo is his architectural triumph, but the Pazzi Chapel in Santa Croche shows his minimalist style. The colorful ceramic roundels are added by Lucca della Robbia. Though Brunelleschi may have revolutionized architecture I, for one, am very grateful to the patrons such as the Pazzi’s and Cosimo de Medici who also liked a little decoration in in their lives. Cosimo also hired Donatello to give relief to the architecture. Of course, one of the many MUSTS of Florence is the Uffizi. the museum with many of the greatest two dimensional treasures of the town or world for that matter. Probably the most famous are the Botticelli of the Primavera and the Birth of Venus. But these are not necessarily the most important. How do you pick between the Cimabues, the Giottos, the Duccio, the Lorenzo Monacos, the Ghirlandaios, the huge Hugo van der Goes triptych, it just goes on and on. We wandered into churches that were not necessarily on the top of anyone’s list and found treasures even in these. The church of Orsanmichele has a gallery above that is open only one day a week. There we found the amazing sculptures that were once on the outside of the church and are now replaced by copies. One truly gets the monumentality when looking up at these marbles and bronzes up close. Here we have the Giovanni da Bologna of Saint Luke. The Bargello, the National sculpture museum, has many of the bronze sculptures that have been taken from the buildings and loggia in order to protect them from the elements. Unfortunately, the floor with all the small bronzes was closed and they did not know when it would reopen. When I think of those rooms I have to think of my parents who in the 1930’s received a sculpture tour of Florence by none other than Leo Planischig, the guy who wrote the books, including one called “Piccoli bronzi italiani del rinascimento.” Boy, I wish I had been on that tour… you probably do too! I feel a bit overwhelmed trying to do a blog on Florence. one can only write in superlatives when it comes to the art.